LAHAINA — There wasn’t much drama to Lahainaluna High School’s 54-0 win over King Kekaulike to finish the Maui Interscholastic League slate for both teams on Saturday night at Sue Cooley Stadium. 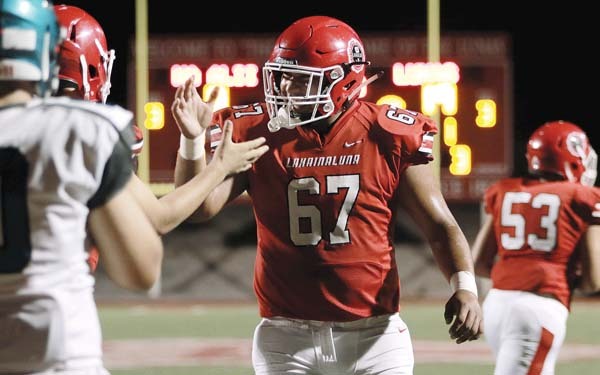 The Lunas, who rang up an 8-0 mark in MIL play for the second year in a row with their 19th straight overall victory, will likely be back at their home facility for the Division II state tournament semifinals on Nov. 17. 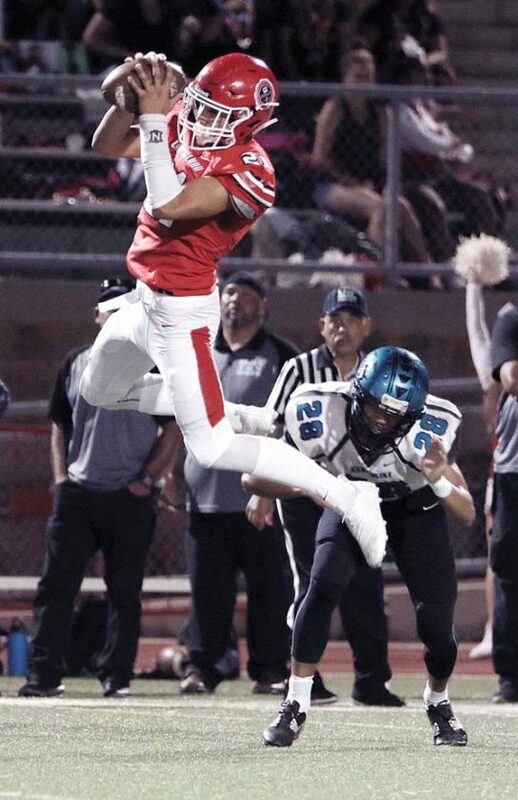 Lahainaluna turned on the mercy-rule running clock when Kawehi Gillcoat caught a pretty 14-yard pass from Nainoa Irish just over a minute into the second half to make it 40-0. 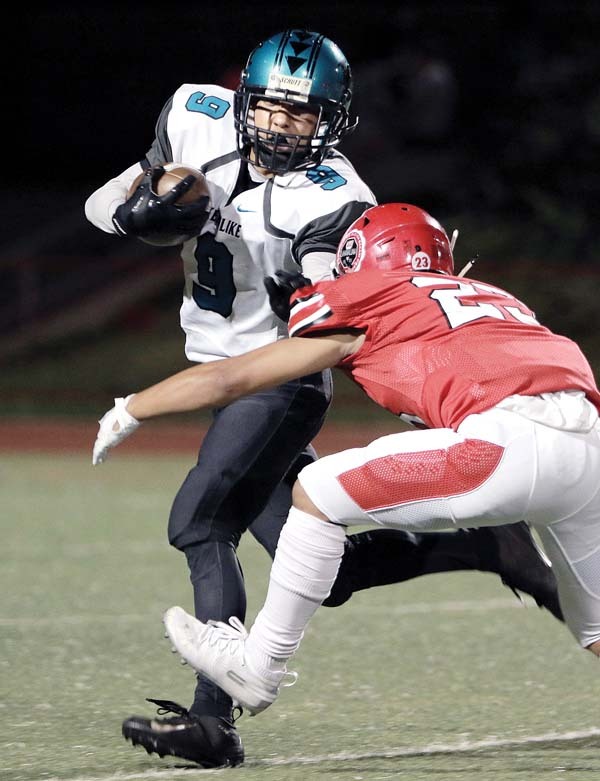 Tysyn Estrella, recently called up from the junior varsity, grabbed an interception on a pass by King Kekaulike’s Puna Kaeo and returned it 30 yards for a touchdown to push the lead to 47-0 with 9:03 left in the third quarter. Kamalei Watson’s 49-yard punt return set up the final touchdown, a 1-yard run by Imee Koike with 10:34 to play. Saturday’s game was a makeup for the Aug. 25 game postponed by Hurricane Lane. 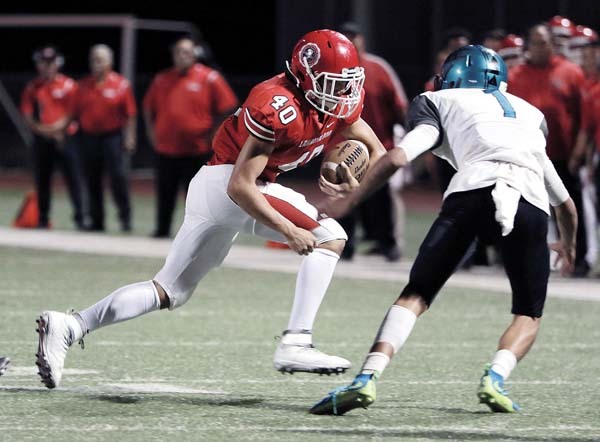 If the schedule had gone as originally planned, the Lunas would have had a 36-day layoff between their final league game and the state tournament. Tihada was diplomatic when asked about where his team will play, likely as the No. 1 seed in the Division II state tournament as the two-time defending champions. It will be on Maui, either at War Memorial Stadium in Wailuku or the on-campus Cooley facility. The Lunas rolled to a 33-0 lead at halftime using 17 different ball carriers in the first 24 minutes of play — for the game, 19 different players carried the ball for Lahainaluna, which piled up 16 first downs in the first half and 24 for the game. After running back Joshua Tihada rumbled into the end zone from 18 yards out just over a minute into the game, two senior linemen were given the chance to tote the football, and both scored on their single carries. Apakasi Felemi’s 16-yard run made it 13-0 with 7:18 left in the first quarter after three complete passes by two different quarterbacks moved the ball 30 yards downfield. On the next Lahainaluna possession, Ikaika Viela dove in from 3 yards out to make it 19-0 with 4:25 to go in the first quarter. Senior Kamalei Watson capped a 67-yard, seven-play drive with a 16-yard touchdown run to push the lead to 26-0 with 40 seconds to go in the first quarter. Watson’s scoring run came on a “swinging gate” play where the offensive line spreads out across the field with the backs also spread wide. The snap was scooped to Watson at an angle into the backfield, and he rumbled untouched to the end zone on the unique play. Esekielu Storer scored on a 5-yard run to just over a minute into the second quarter to account for the halftime margin. King Kekaulike had a 33-yard field goal blocked on the next-to-last play of the first half. Na Alii finished with three first downs in the game, which was their 41st straight loss. Perhaps the biggest contrast between the two programs was the Lunas had 21 seniors celebrated at their final home game before the state tournament, while Na Alii will graduate just five off of this roster. LL–Joshua Tihada 18 run (Kaihulali Casco kick), 10:43. LL–Apakasi Felemi 16 run (run failed), 7:18. LL–Ikaika Viela 3 run (kick failed), 4:25. LL–Kamalei Watson 16 run (Casco kick), 0:40. LL–Eeskielu Storer 5 run (Casco kick), 10:44. LL–Kawehi Gillcoat 14 pass from Nainoa Irish (Casco kick), 10:44. LL–Tysyn Estrella 30 interception return (Casco kick), 9:03. LL–Imee Koike 1 run (Casco kick), 10:34. Junior varsity–Lahainaluna 69, King Kekaulike 6. MH–FG Brex Delray 32, 3:00. KSM–Ezekiel Weber 6 pass from Tiliti Adams (Cruz Braun kick), 0:48. MH–Naia Nakamoto 2 run (Delray kick), 1:10. KSM–Makani Smith-Kemfort pass from Adams (Braun kick), 2:51. MH–Mone Tongi 75 kickoff return (Delray kick), 2:36. KSM–Tiliti Adams 4 run (Braun kick), 1:52. RUSHING–Maui High, Nakamoto 23-78, Torryn Kauhaahaa-Sulusi 6-16, Christian Lee 1-11, Tongi 2-6, Jeremy Gonzalez 1-4, Mitchell Hirose 1-0, Taelen Bates 2-(minus 8), team 3-(minus 24); Kamehameha Maui, Dane Abarra 20-117, Adams 10-29, Catan 1-8, team 1-(minus 3). PASSING–Maui High, Kauhaahaa-Sulusi 6-16-0–40, Bates 2-8-0–27; Kamehameha Maui, Adams 14-29-5–208. RECEIVING–Maui High, Hirose 4-55, Lee 2-3, Trent Takara 1-8, Gonzalez 1-1; Kamehameha Maui, C.J. Hamasaki 4-34, Catan 2-37, Smith-Kemfort 2-29, Weber 2-18, Trystan Ah Yah 2-18, Abarra 1-45, Karsyn Pupunu 1-27. D-I overall championship: Baldwin vs. Maui High at War Memorial Stadium, 7 p.m.